17 Jan 2018 --- Comax Flavors has released new primary research on consumers’ behavior, usage and attitudes towards yogurt. This is the fifth study of the company’s primary market research program. The yogurt study was fielded in June 2017 with 500 US respondents aged 18-70+; half of which were parents of children aged 1-17. In addition, the sample featured 250 female and 250 male respondents. "Over the last year we have seen the US yogurt market as well as the milk market struggle with strong competition from alternative plant-based proteins. We wanted to better understand consumer usage and drivers in the yogurt market," states Catherine Armstrong, Vice President of Corporate Communications for Comax Flavors. Comax has partnered with Amy Marks-McGee of Trendincite LLC to manage the market research program and Costello Creative Group to translate the data into creative, fun and easy-to-read infographics. Additional Comax studies include: alternative dairy products, sweet baked goods, bread and crackers. “Flavor” is the number one driver of yogurt purchases with more than half (52 percent) of respondents citing it as the most important attribute. A quarter of adults (26 percent) and two-thirds of children (66 percent) consume "Drinkable" yogurt. "Greek" yogurt is the most popular style consumed by adults (56 percent) while "Whole Milk" is preferred by children (50 percent). “Berry” is the number one flavor consumed by both adults and children with almost two-thirds (61 percent) of adults and more than half (58 percent) of children citing it. “Tropical” yogurt is the second most popular consumed by adults and children with 45 percent of adult respondents and 47 percent of parents citing it. Similarly, "Vanilla" yogurt is a universally well-liked flavor and equally consumed by adults (44 percent) and children (43 percent). 21 percent of Baby Boomers consume "Coffee" flavors compared to 19 percent of 15-17-year-olds. Gen X and Baby Boomers equally consume (8 percent) "Vegetable" and "Botanical/Floral" flavors while 20 percent of 3-5-year-olds consume "Vegetable" and 21 percent of 9-11-year-olds consume "Botanical/Floral" flavors. 32 percent of adults flavor their yogurt compared to 68 percent who do not. 50 percent of parents flavor their children’s yogurt while the other half do not. 17 percent of adults consume prepackaged yogurt with add ins/toppings compared to 23 percent of children. Yogurt is used in multiple food & beverages by respondents: 51 percent use in "beverages"; 39 percent use in "sweet preparations"; 28 percent use in "dips & dressings" and 18 percent use in "savory preparations." 36 percent of adults and 47 percent of parents use yogurt in place of mayonnaise, sour cream, crème fraiche and/or oil. 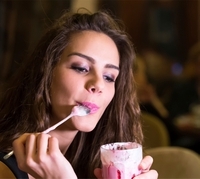 69 percent of adults and 79 percent of children consume yogurt as an alternative to an indulgent dessert or ice cream.